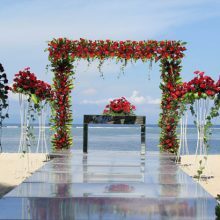 Standing forty-six meters above sea level of World famous Uluwatu surf break, Kamaya Bali is one of special and unique wedding and event venue in Bali. 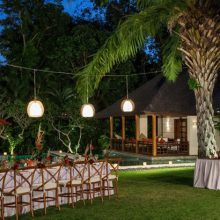 Surrounded by lush tropical landscape, they offer stunning venues for different sizes of wedding party. Kamaya Blessing is uniquely shaped octagon chapel, could be either in air conditioned comfort or open air to the sea and accommodate up to 80 people seating. Kamaya Peak can easy accommodate up to 60 people seating, which also could be enjoyed air conditioned or opened up to feel the power and aura of the surf crashing into the cliff below. 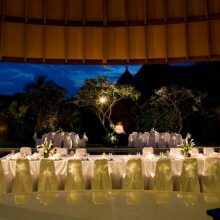 •	Dinner reception is compulsory for 17:00 slot time.